Beach Garden Cottage is a romantic one bedroom getaway with private beach access. Beautifully appointed and tastefully decorated, this welcoming retreat has a queen bed, sitting area with cozy couch, kitchenette with built in seating/dining area, and a full bath. The large picture windows over the dining area and living area/bedroom flood the home with natural light, bringing a wonderfully warm and luxurious feel to this magical retreat. For a real escape, bring only your clothes, as this little gem has all you need from bed linens and towels to a microwave, fridge and apartment size stove/oven. Stay in and cook, enjoy snuggling on the couch while watching a movie or maybe just a nice glass of wine and some conversation. This sweet little cottage is brimming with possibilities. Whether you are craving an escape from the hustle and bustle of city life or are looking for a couple months respite, the Beach Garden Cottage will not disappoint. 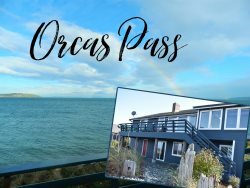 Enjoy the water views right from the cottage or take long leisurely walks to see birds at play, ever changing marine traffic and the vibrant colors of sunrise or sunset. If you enjoy being on the water, bring your own kayaks and launch directly from the beach. Downtown Sequim is only a 10 minute drive away and has lots of wonderful restaurants, coffee shops and quaint gift shops to discover. The Dungeness Spit and historic Dungeness Lighthouse are a quick few miles away and offer stunning hikes and a 6 mile stretch of pristine beach to walk. Take a bike ride through the Dungeness Valley and visit the famous Lavender Farms that dot the landscape and tour the Railroad Bridge Park off of the Olympic Discovery Trail. If you feel like traveling a bit further west, the first entrance to Olympic National Park at Hurricane Ridge is just 40 minutes from the home. A couple hours further west, you can explore the Pacific coastal beaches, hiking in the Hoh Rain Forest and waterfall trails at Lake Crescent and Sol Duc. And after all these exhilarating experiences, the Cottage's reflective and tranquil spirit welcomes you back again and again. We hope you will enjoy making lasting memories at the Beach Garden Cottage. This is NOT a pet friendly home. Loved the cottage and Sequim. Very clean well decorated and beautiful location. Would stay again. Check in time is 4 pm at our office in Sequim, 61 N Rhodefer Rd. Keys and directions to the home will be given at the time of check in.